Ive been commuting downtown by bike 4 days per week for the last 2 years. I even bought a nice commuter bike for myself last year. I started having problems with broken spokes on the rear wheel of my bike last month so I took it into the shop. A year of riding the riding the bike lanes on Breckinridge and Kentucky Ave. had bent my wheel to the point that it needed to be replaced! A bike that’s a year old shouldn’t need a wheel replacement. Unfortunately, those bike lanes are so rutted and full of potholes, it’s very damaging to ride on. I’ve also had issues with bike lights or even my saddle-bag falling off from all the bumping around. I was hopeful this summer when the city came and tore up a bunch of the painted lines and arrows. My dream was that they were finally going to repave those lanes. They tore up a ton of asphalt, then just slapped new lines and arrows down leaving big chunks torn out of the road. Now, every time I get to an intersection, I have to weave through where the old lines used to be. I’m grateful that we have the bike lanes. It’s a good start. But Louisville needs to step up its game if it’s serious about becoming a more bike-friendly city. More dedicated bike lanes. Protected bike lanes are the best and we don’t have any of those yet. And slapping a bike-lane logo in the gutter doesn’t count as a bike lane (Westport Rd, I’m looking at you). Clean up the bike lanes we do have. That means repaving as needed and regular street sweeping service. There are plenty of places where I have to ride outside of the bike lane because there’s so much debris. 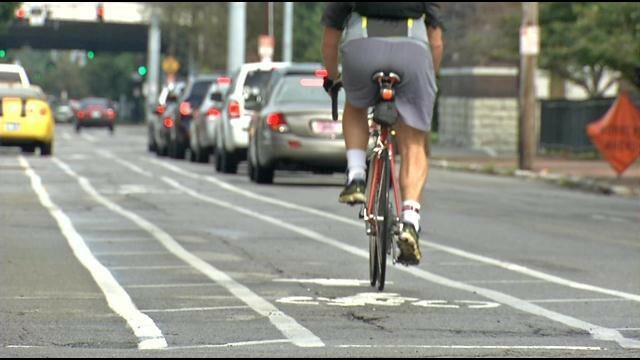 Make sure bike lanes fit in the flow of traffic. No more bike lanes that disappear at a complicated intersection, the reappear on the far side.